It seems like 2009 was the year of iPhone app mania... or maybe it's just because 2009 was the year I got my iPhone. I spent an inordinate amount of time downloading and playing around with some of the 90,000 apps in the iTunes app store in all kinds of categories. So now it's time to take a look back at the top apps of the year - either built by Toronto companies or focused on Toronto. Below, in no particular order, are the Top 10 iPhone apps of the year. Ever been blindsided by a flight delay, or waited in a giant lineup to check in? As someone who travels a lot I know the hassle of airports can be frustrating to say the least. 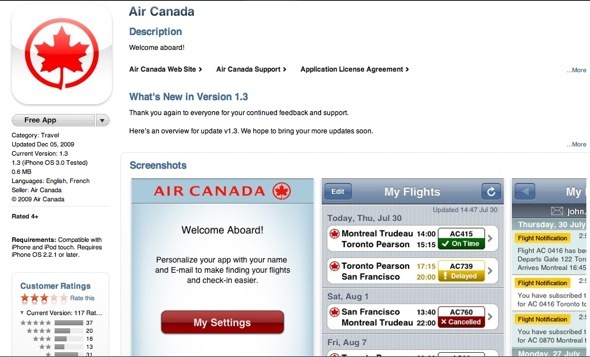 Enter the Air Canada app, developed by IBM Canada. You can add your flights and check their status, check in, find flights for future trips, and even rent a car. The app was selected by Apple as one of the Canadian iTunes Rewind Best of 2009, and in late November 2009 reached 200,000 total downloads. 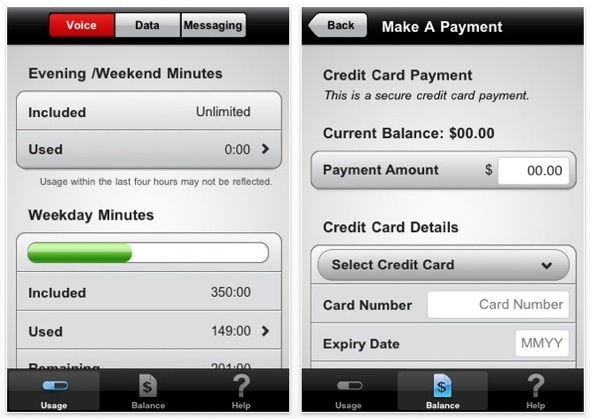 In addition, it was awarded Best Mobile Application at the 2009 Canadian New Media Awards. You don't have to be a journalism school grad like myself to know that for traditional media, the times they are a-changin'. Developed by local company Spreed (they design mobile apps for content providers and are also behind the new Metro app) The Globe and Mail app lets you instantly check breaking and popular news stories in nine categories, and share them with your friends via Twitter, Facebook or e-mail. It has offline reading support for iPod Touch users, and they'll soon be adding a video and comments component. The app has over four million page views a month, and Spreed is actively soliciting feedback at http://globeapp.uservoice.com. For those of us who love shopping, a trip to the Eaton Centre is a treat. For those who loathe it, it can be a maze of stores and chaotic crowds. 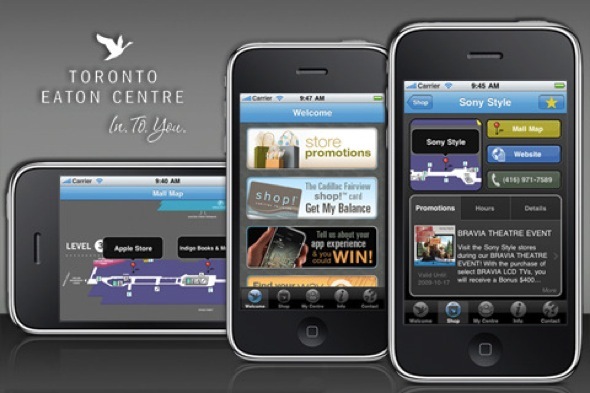 The new Mobilefringe Toronto Eaton Centre app helps everyone, from shopping addict to the other end of the spectrum. It lets you view its stores in an interactive mall map, and has a store directory you can navigate by category or promotion. Check out hours and event information, let your friends know you're shopping, and best of all find promotions for all your favourite stores. Getting your wireless bill each month can be a very unpleasant surprise - I know that my jaw has dropped this year as I've seen international roaming charges inflate my bill. But the new Rogers/Fido My Account app lets you keep track of your usage - it automatically pulls your account details from your network connection and SIM card when you download the app. It tells you the services included in your package, and what you've used up so far in the current billing cycle. The information updates every 20 minutes so it's current, and you can even pay your bill. Just don't go over your data limit while you're doing it. I love the idea of reading books electronically (who wants to carry around a novel? My laptop is the only weight worth carrying around), but I don't like the price tags associated with e-Readers. 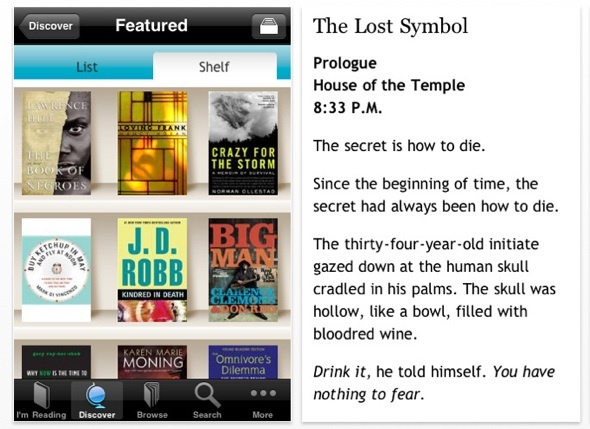 Enter the Kobo app (formerly ShortCovers), Indigo's answer to the Kindle. You can buy books for up to 65% off their retail price, and there are thousands of free classics. And if you're not sure you want to buy something you can read the first chapter for free. 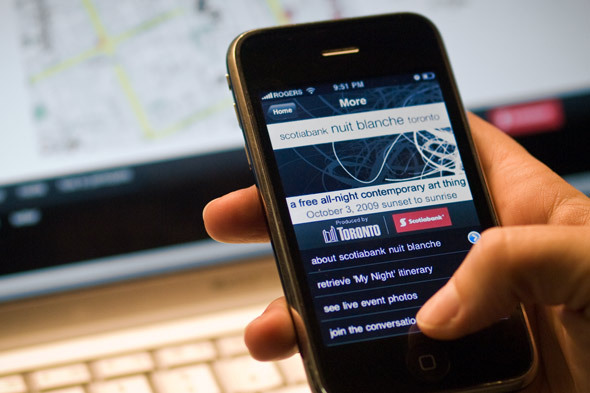 Simply Good Technologies created the Nuit Blanche app as a companion to the popular Nuit Blanche event in Toronto, a City of Toronto produced celebration of contemporary art which took place on October 3, 2009. The app allows you to find project details and TTC routes, use GPS to locate the closest projects, find and share real-time project photos, and access My Night, a personal itinerary planner. It also used Capturefy, a new photo recognition technology. All in all, a great new augmented-reality style app to accompany your night out - make sure you download before next year's event. A top 10 roundup wouldn't be complete without an addictive game. 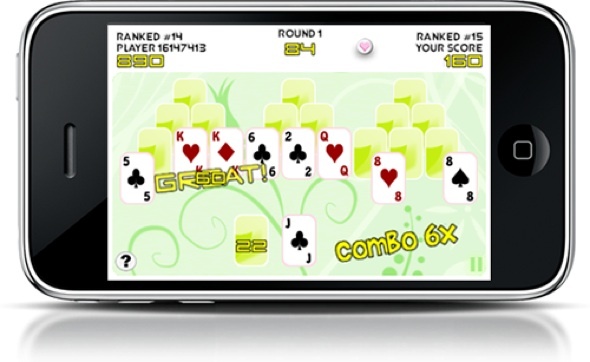 Local iPhone developers endloop created the Arcade Solitaire: TriTowers app - it combines arcade-style sound and graphics with the classic Tri-Peaks solitaire gameplay. It's easy to catch on to the rules - just press the ? button to learn more. And if you're the competitive type you might spend all your time trying to get to the top of the Global Leaderboard. Endloop is also behind the popular apps iHeartRate and Photocaps - so if games aren't your thing you can check out what else they've been working on. I know it might not be considered "cool," but I still love listening to the radio. No, not online radio - the kind you listen to in your car with the cheesy commercials and hyped-up DJs. 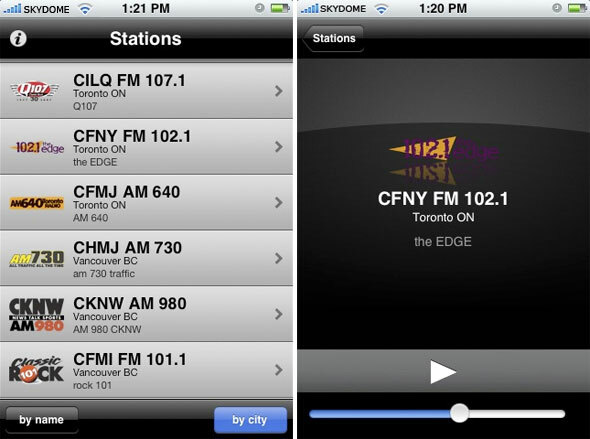 So I love Corus Radio's app - powered by StreamTheWorld it gives you access to 50+ radio stations, including Toronto's 102.1 The Edge, Q107, and AM640. You can sort by station name, city, or nearest to you - perfect for when you're traveling. And who wouldn't love the "shake to shuffle" feature - just shake your iPhone to listen to a randomly selected station. Toronto startup Freshbooks has had a great year - they won the PICK 20 Award for Top Web app, for one. 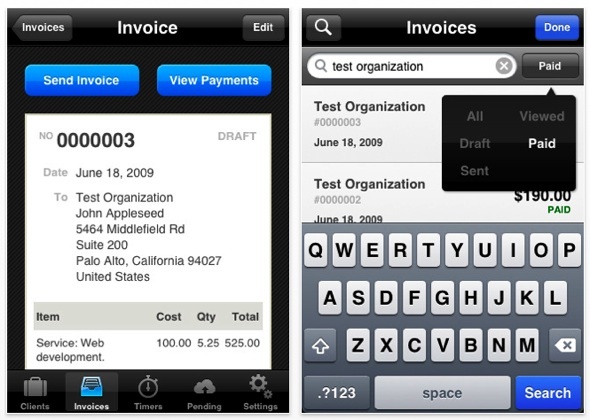 Then they released their Minibooks for Freshbooks app, which was quickly featured at #4 in the app store. Then they were featured in an iPhone TV commercial. Not too shabby! The app is an extension of the Freshbooks invoicing service - it lets customers create, edit and send invoices from their phone. You can try out the Lite version for free, and then decide if you want to buy the more expensive version. Majestic Media Ltd, a Toronto-based creative agency, developed a series of Finder apps that I personally use on a weekly basis. if you've ever searched for an ATM for your bank of choice, then you need to download the TD Finder app, the BMO Finder app, or the RBC Finder app. Never pay ATM fees again! What a delightful thought. If you're addicted to Tim Horton's like I am (an extra-large every morning) then you need the recently-updated Horton's Finder app, which finds the closest place you can pick up a double-double. Apparently other people need to find their Timmy's as well - the app was #1 free app in the Navigation category two days after its release! Have you tried any of the apps listed above? Are you addicted to one we didn't include? Let us know in the comments.